Holiday Inn Christiansburg, VA presents the Valentine's Day Dinner 2019 on Thursday, February 14, 2019. 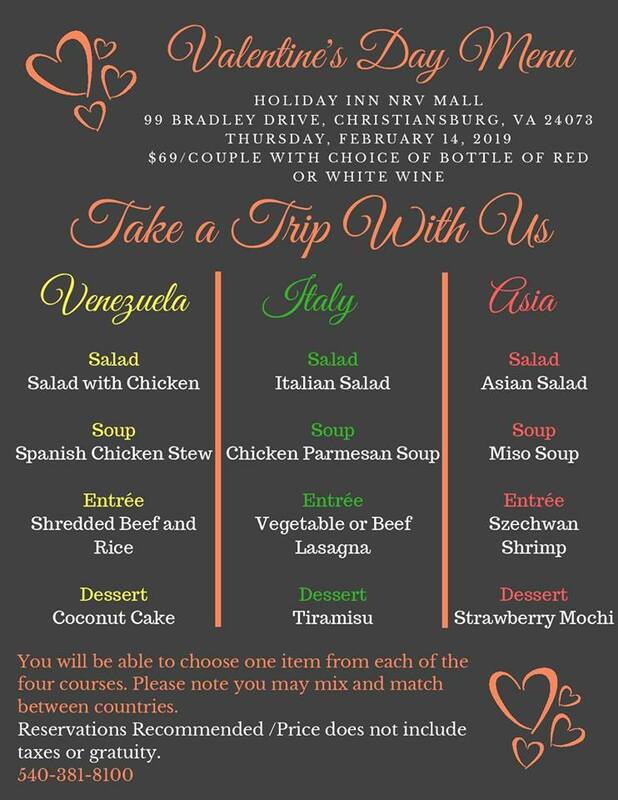 Take your Valentine out for a wonderful dining trip around the world with four delicious courses of your choosing from Venezuelan, Italian and Asian flavors. Dinner also includes your choice of a bottle of red or white wine. The cost is $69.00 per couple. Prices do not include taxes or gratuity. Reservations are recommended. Call 540-381-8100 to make a reservation. To view the event flyer and dinner menu, visit: https://i.imgur.com/rVNZcAQ.jpg.